I've always love to eat Panettone and it is a special bread because it is only available during the Christmas season....my yearly Christmas treat. Panettone is also known as the Italian Christmas bread, it is very similar to fruitcake and traditionally served during the holidays. This bread is truly a holiday treasure to so many families including mine! This bread has long history among the Itallian community, one legend holds that in the late 1400s, a young Milanese nobleman fell in love with the daughter of a baker named Toni and created "Pan de Toni" to impress his love's father. 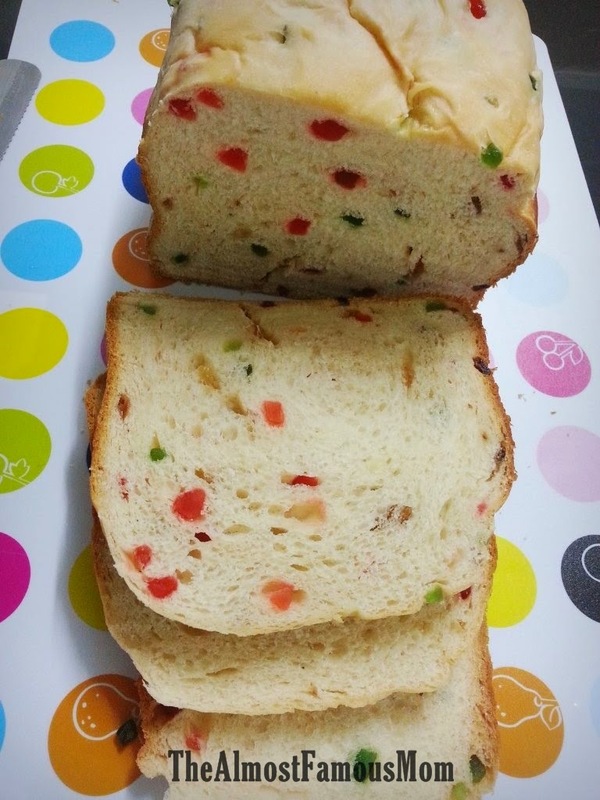 So here is my A to Z in Bread Maker Panettone, even the bread turns out to be very colorful and Christmassy. 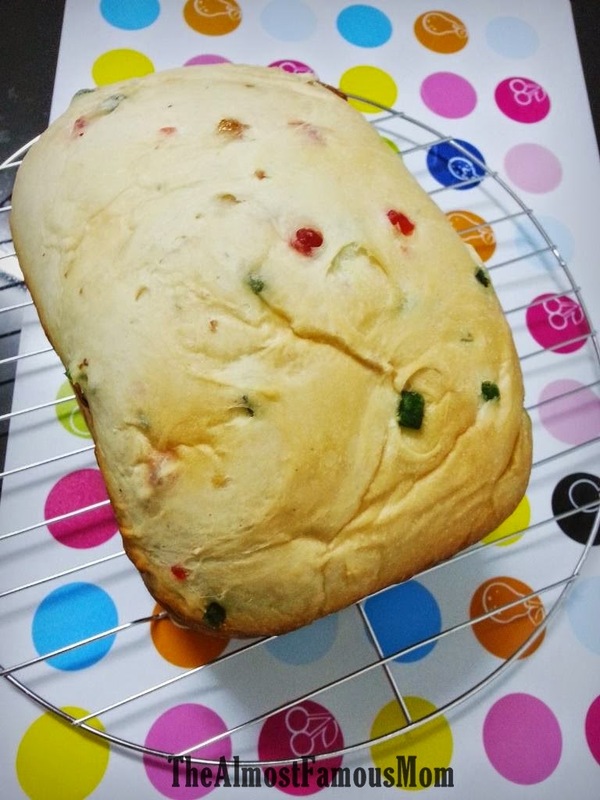 This Italian Christmas bread is made in a bread maker so it takes very little preparation time. Happy Baking! Put all the ingredients except the mixed fruits in the bread maker pan (according to your model's instruction). Usually I will put all the wet ingredients then follow by dry ingredients, and lastly add in the yeast. Set the bread maker to Sweet Mode with 1.5lbs and Light crust. Only add in the mixed fruits when the machine beeps to indicate that it is time to add the additional ingredient. Let the bread maker do all the baking, once it is done remove baked bread from the pan and let it cool on wire rack. Hi Samantha, can I cut down on d condensed milk n is d bread still soft d next day ? Samantha am i rite to say that if i reduce condensed milk by 30% I should add 30% more to d whipping cream ? by calculation is correct but i would say best rely on the texture of the dough, especially the first 10 minutes. If the dough is too dry you will notice the dough is flaky and extra flour on the pan. so at this point you can add whipping cream little by little so that the dough have enough moisture (not too watery - if too watery try adding some bread flour). Trying our my bread machine. What is 4232 Bread Flour? Is it 400gm ?